TxEdge T2 for HDc is standard-based solution that enables the delivery of DVB-T2 regional or local services over SFN networks while saving operating OPEX by optimizing the distribution network bandwidth. In 2011, MULTICHOICE, the leading multichannel digital television operator across the African continent, has selected the TxEdgefor the deployment of the world’s largest DVB-T2 network over Pan-African countries with a total bouquet of more than 50 different channels in various languages over 15 countries. Since then, it has been deployed by leading TV operators across Africa, Asia and Europe. The PLP aggregation technology is an advanced and flexible regional content insertion solution that behaves as a PLP remultiplexer. It allows aggregating one or several PLPs between the national and regional T2-MI stream to build the regional multiplex. 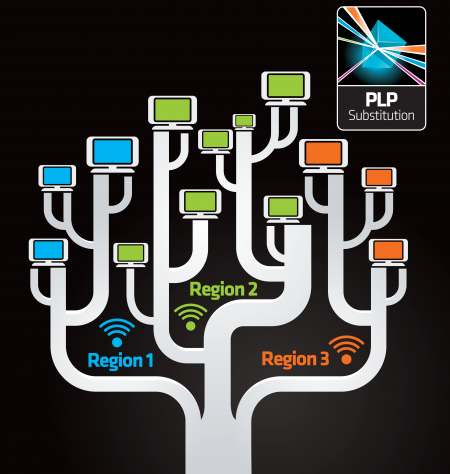 In some region, the TxEdge may aggregate 3 PLPs while in another regions, it will create a multiplex composed of 2 PLPs. In each region, the TxEdge guarantees the broadcasting over SFN networks. The use of Multi-PLP architecture and PLP Substitution brings unmatched flexibility to the Network Operator and allowing a drastic reduction of the operational costs; all common TV content (national or international) being delivered only once to save the distribution network bandwidth. ENENSYS patented technology (rEWS) is a receiver-agnostic system providing video-based emergency warnings on a regional basis of dangerous weather events and natural disasters for DVB-T2 networks. TxEdge with rEWS allows normal programming to be interrupted to play out the emergency alert, replacing all the normal A/V transport stream components with the emergency alert A/V content. 43 mm / 1.69 in. 443,7 mm / 17.46 in. 322,8 mm / 12,70 in.